Three new VistaJet owned Challenger 350 aircraft, with a list price value of US $80 million under operation with Priester Aviation in the United States since June 2015. 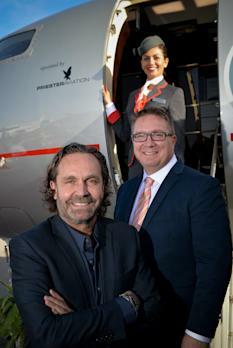 Seven VistaJet owned aircraft now in service in the United States, over 55 aircraft worldwide. Offering the only true worldwide service area in business aviation, one way pricing and guaranteed availability. VistaJet, the leading global business aviation company, and Priester Aviation, an industry leading provider in business aircraft management and operations, announced today that Priester Aviation will operate a U.S.-based fleet of Bombardier Challenger 350 jets for VistaJet's Flight Solutions Program. Service began in June 2015 and there are currently three VistaJet Challenger 350** jets under operation with Priester Aviation. VistaJet acts as agent for U.S. Flight Solutions Program customers to arrange flights that will be operated by Priester Aviation within the U.S.
"We are very pleased with the rate of growth in the United States and are delighted to add service on Challenger 350** aircraft to complement the larger Global 5000** jets," said Thomas Flohr, Founder and Chairman, VistaJet. "Our alliance with Priester Aviation solidifies our commitment to the North American market. Priester Aviation has an impeccable reputation for aircraft service, charter operations and management in the United States. Like VistaJet, they have solid roots as a family operation and understand the importance of impeccable customer service." "We're proud to be selected as VistaJet's operator of choice for their U.S.-based Challenger 350 aircraft," said Andy Priester, president and CEO for Priester Aviation. "Our reputation for excellent service combined with our robust and advanced operating systems make us a natural partner for VistaJet." Featuring a jump seat for the Cabin Hostess (VistaJet is the only service provider with a Cabin Hostess on every flight) and cabin divider door, VistaJet's Challenger 350** aircraft configuration mirrors the high standard and privacy of its larger Challenger and Global aircraft counterparts. The Challenger 350 jet is equipped with the industry's latest and among the most sophisticated cabin management systems, including in-flight Wi-Fi, a modern business suite and trim panel speakers for the ultimate in-flight sound. On October 28, 2015, a U.S.-registered Bombardier Challenger 350 aircraft, owned by VistaJet and operated by Priester Aviation set a world speed record in its class, flying from Napa Valley to the Cayman Islands - a distance of 2,774 miles -- (4,463 km) in 5 hours and 5 minutes***. The aircraft departed Napa County Airport in California at 8:22 a.m., PDT, on October 28, 2015, with three crew and 2 passengers on board. The maximum cruising speed was M 0.83 at a cruise level of 41,000 feet (12,497 m). The pilots touched down at Owen Robert International Airport in Grand Cayman at 1:27 p.m. PDT with more than sufficient fuel reserves. Priester Aviation is among the world's most experienced global private aviation companies, specializing in aircraft management and private jet travel solutions. With 70 years of experience, Priester Aviation is an elite private aircraft operator that holds the highest safety accreditations including the ARGUS Platinum rating, Wyvern Wingman, IS-BAO Stage III and Air Charter Safety Foundation certification. News and information are available at www.priesterav.com. Founded in 2004 by Thomas Flohr, VistaJet has established itself as the global leader in premium long-range private jet travel by consistently providing excellent service and unrivalled quality to its fast growing clientele, connecting them to every corner of the world with point-to-point coverage. VistaJet operates a young fleet -- total fleet average age is under two years -- of over 55 Bombardier* Global* and Challenger* business aircraft and offers the industry's largest service area, covering all major markets. The Company's unique and successful business model provides all the benefits of owning a personal jet without the responsibilities or asset risk of ownership. VistaJet aircraft have to date visited over 180 countries, landed at 1,354 airports worldwide, logged over 73,500 flights and carried over 174,000 passengers. News and information are available at www.vistajet.com. ***The flight is currently awaiting approval from the National Aeronautic Association (NAA). Once validated, the NAA will submit the record to the Fédération Aéronautique Internationale (FAI) in Lausanne, Switzerland, for international ratification.